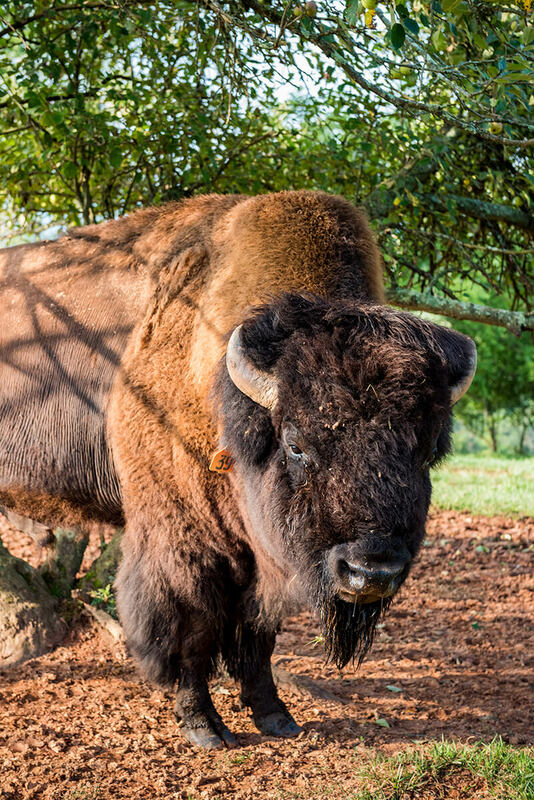 The road to a 120th birthday party could start on a western North Carolina ranch full of yaks, camels, elk, and (especially) bison. “I’m middle-aged,” he says. Frank King is 62. “Just think about how much more I can do in the next 60 years of my life,” he says a few minutes later. At the office, King wears a pair of dress slacks — jeans on casual Fridays — and a polo shirt, usually with the company logo on it. Out here on the farm in Leicester, though, where King visits twice a week, he’s wearing an untucked, yellow, cowboy-cut collared shirt patterned with tiny bison, the sort of thing you can get away with if you’re the boss, which he is. The shirt is also the sort of thing that foreshadows the tour we’re about to take. Of all the animals we’re about to see on this farm — dozens of acres across rolling green and grassy hills, in a part of the state where bears, cows, and deer are common — the bison are among the least weird. “You’ll see camels everywhere,” says Dr. Frank King. Camels are usually the first animals that visitors encounter. Himalayan yaks are around, too. We don’t stop for the yaks. We approach an 8-foot-high fence, and King hops out to unlock yet another gate. The truck rolls through a creek and up toward a hillside shaded with oaks, maples, and sycamores: elk and deer country. King wants to find a better way to harvest the velvet from their antlers, which the Chinese have been using as a healing agent for thousands of years. Right now, the elk are hard to see, but they’re usually pretty curious, he says. They’re big, with those good Rocky Mountain genetics. A normal elk might have six or eight points on their antlers. One up here will have 26. We rumble back toward the other side of the farm, slowly, across the sloping grassy fields. The truck bumps up and down. When the path smooths out again, we stop behind a shed full of 1,500-pound hay bales brought in from North Dakota, next to a 7-foot-tall corral built with heavy pipe. “Like Jurassic Park,” King says. We pull through one more gate and on to the final stop of the tour. More than a dozen bison stand on a gentle rise, curiously watching us approach. King rolls down a window, and the animals size us up. Start making noise. Some emit low grunts; others, the bulls, sound more like lions. A few roll around, hoping the dust that settles on their backs will keep flies away. King pulls the truck right into the middle of the herd, and puts it in park. He has a lot to say about the bison. As many as 60 million bison roamed the continent. The man who may have really saved the bison, though, was Ted Turner. He bought his first bison in 1976. In 1987, he used some of the wealth from his television empire to buy his first ranch in Montana. Turner went on to buy 16 more ranches in seven Great Plains states, and today he’s the second-largest individual landowner in North America. Turner’s bison herd is now 51,000 strong. The meat from those animals goes to Ted’s Montana Grill, which has 45 locations in 16 states, and is also owned by Turner. Today, most bison in America live out west. In North Carolina, there are, by most estimates, fewer than 1,000. 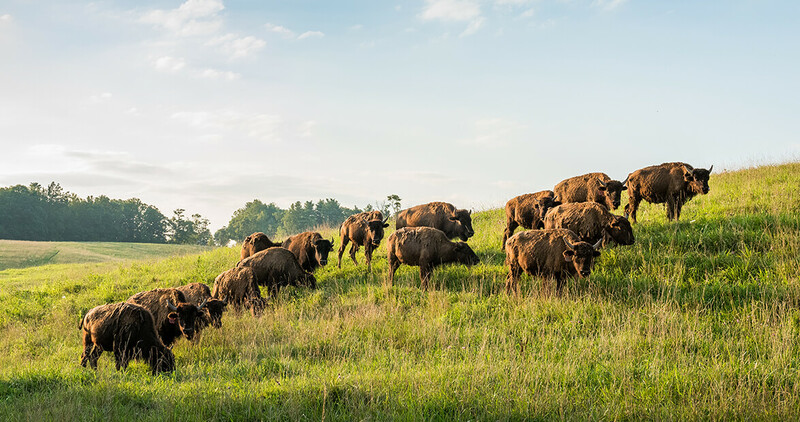 The 300 or so bison on this farm are a mix between Canadian woods bison, American plains bison, and European bison, crossbred to put diversity back into the herd. 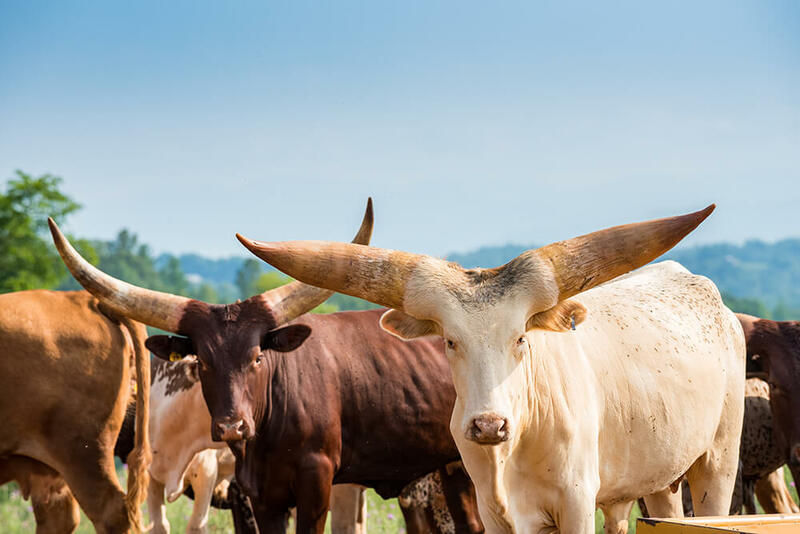 King once bought, for its genes, a bull from a Crow Indian reservation in Montana that had been pulled out of a canyon by a logging helicopter. Here, somewhere, is another bull that weighs more than 3,000 pounds, the largest one currently on record. King’s not sure of the animal’s exact weight. “He won’t fit in the squeeze anymore for us to weigh him,” he says. The bison with the biggest heads are the breeding bulls; they make sounds that resemble a lion’s roar. Bison are efficient. Their wool is 40 times warmer than sheep’s wool. You can raise three of them on the same grass or feed that sustains two beef cows. Here, the animals all drink springwater. Twice a year, non-GMO grasses are seeded for the bison to graze on, which they digest so well that their feces don’t smell. These bison aren’t for milking. They’re for eating. The animals’ tough, brawny look gives the wrong impression. In reality, their meat is chewy, flavorful, and more nutritious than other red meat. It has about the same amount of protein as beef, but fewer calories, and less fat and cholesterol. And over the past 10 years, the price of bison meat has come down considerably, although it’s still more expensive than beef. It’s also harder to find. The 500,000 or so bison in North America are a mere rounding error compared to the roughly 90 million cattle that are living on farms in the United States alone. The meat industry is set up to process cattle. Far fewer slaughterhouses are equipped to handle the bigger, bulkier, more athletic bison. The result: The average American eats about 71 pounds of red meat — beef, veal, and lamb — per year, compared to just one ounce of bison. That needs to change, says King, who has more than just a nutritional interest. 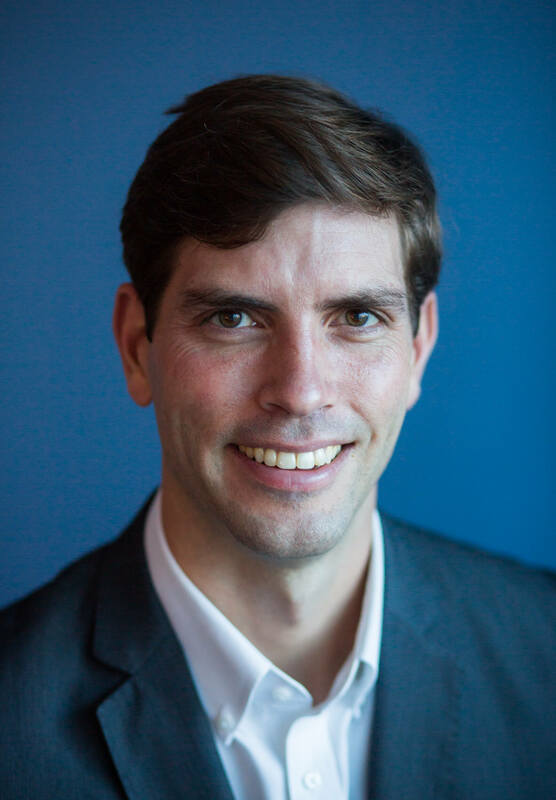 His company, Dr. King’s Farms (formerly Carolina Bison), now sells millions of dollars worth of bison meat at stores like Earth Fare and Harris Teeter, and at nearly two dozen restaurants around Asheville, including the Biltmore Estate and the Omni Grove Park Inn. Tours of the farm and promoting bison as the healthy underdog to big beef are part of a business plan. King, as he’s apt to do, is thinking bigger. We need better food. Better habits. Better lives. “We need a big change in this society,” he says. If you believe him, you might also believe that this farm could hold the key to making it happen. “It’s a lot of work,” Mike Ellington says between cigarettes. If King’s high-energy effusiveness revs you up, Ellington, who’s run the farm for four years now, brings you back to earth. King’s the dreamer here; Ellington’s the doer. Today, he and his four-person crew are extending an 8-foot-tall fence across a hillside, to pen in more deer and elk. It’s gone well up until this point. Ellington had already marked off some of the fence posts using a quarter-mile-long string line, and was digging the first hole with a Bobcat when two of his guys came rolling through the field in a Chevy 2500 pickup, right through the line, snapping it. Ellington unleashes a sonorous string of curse words. Mike Ellington, a former rodeo clown, now runs the ranch, and cares for the animals. What he moved on to was construction, building big beach houses and businesses in Florida. One, a warehouse he built for $200,000 near an airport, became the home of a cigarette boat rigger and ended up being worth $4.5 million. He came to Wolf Level in Madison County, and started building things on Biltmore’s spacious property. As money became a nonissue for Ellington, construction started to become tiresome. He quit. He got bored. He wanted to get back out on a farm. And then he saw an ad on Craigslist. That ad took him to King’s farm, where he had to learn to take care of animals that were more exotic than the ones he’d grown up with. Take the camels. “They actually love cold weather,” Ellington says. He learned that fact through research on the Internet, and ended up calling a few people in the Middle East to help figure things out. For instance: When cattle and bison have babies, the calves are up and walking around in 10 or 15 minutes. But a camel will have her baby, and sometimes leave for a day, meaning that baby will sometimes stay in that same spot, alone, for 24 hours. That’s totally natural, Ellington says, even though it doesn’t feel that way. Bison can jump up to six feet in the air, standing still. That corral is built stronger and taller than ones used for cattle, because bison can jump up to six feet in the air, standing still. The pasture fencing used to contain them is stronger and more expensive than the fencing used to keep cattle. A bison will sell for more than a head of cattle, but they cost more to raise. Ellington leans over. “Here’s the deal,” he says. “The bison grow slower.” They’re usually harvested at 24 to 30 months, compared to a minimum of 12 to 16 months for beef cattle. Here’s the other deal: This farm is not large enough to be sustainable. 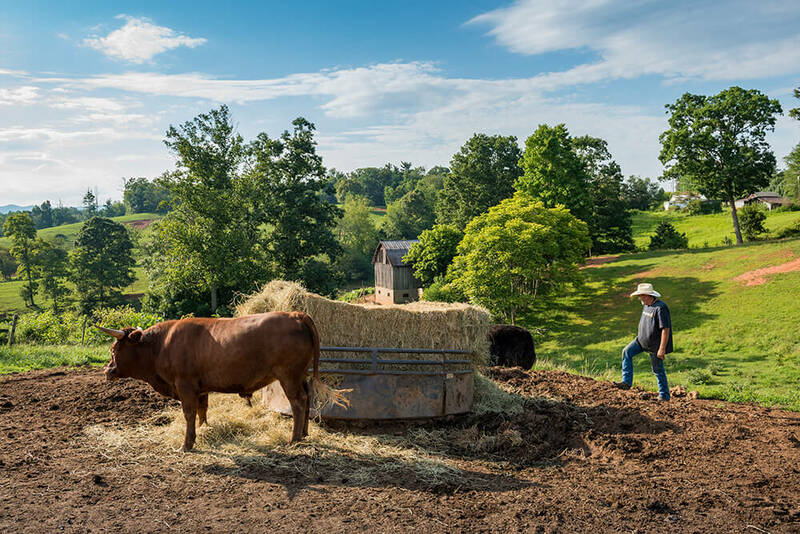 With 160 acres in this spot, along with another 400 acres nearby that run from a ridgetop down into the French Broad River Valley, the bison sold here won’t cover the cost of running the ranch. (Most of the meat sold by Dr. King’s Farms comes from other farms, many of them in Western states.) Ellington thinks that to break even, the farm would need to be a minimum of 4,000 acres. This farm is for research, sure, but really, it’s for show. Tours are already underway here, and Ellington is going to turn an old tractor into a replica train to take people along the same route I rode with King. There’s even talk of building an old-timey Western town. The tours work. “People freak out,” Ellington says. “They don’t expect to see a camel out here in the mountains.” Or the elk. Or the bison. Or the Watusi with the comically oversize horns. The camels, though, tend to be the most popular. 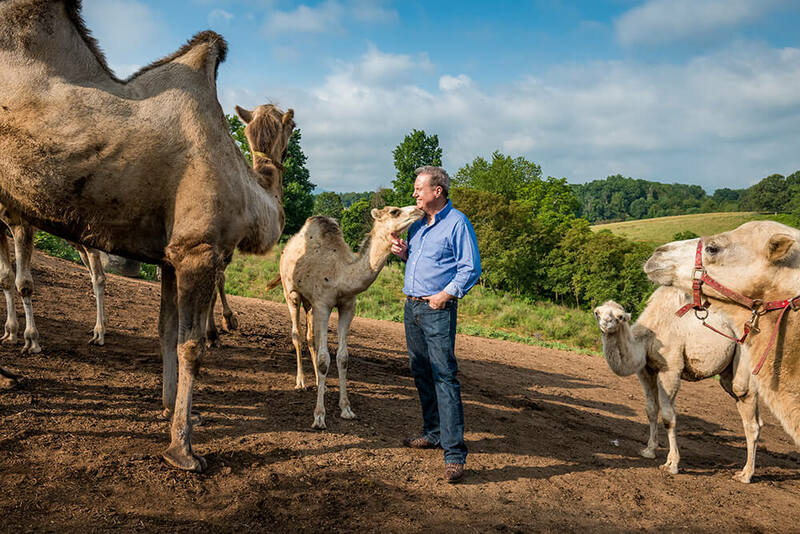 “The camels are just like big, giant goats,” says Mike Ellington. 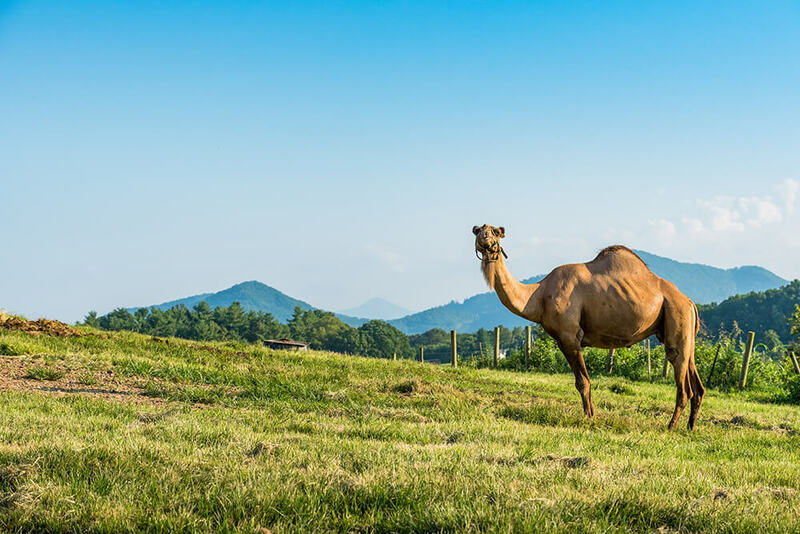 The dromedary variety has a single hump; the Bactrian has two. One of the farmhands, Rena Payne, is supposed to take a picture of a camel. Payne is a petite 20-something, and she can’t drag Glacier, a tall and suddenly stubborn two-humper, into a photogenic spot. And so she pulls. And pulls. Nothing. “It’s hard to get a 2,000-pound animal to move,” Payne says. Finally, after three people get involved, Glacier reluctantly moves into position for his close-up. If there’s one thing Frank King likes to talk about as much as bison, it’s boxing. He goes on about the sport’s long fade, and the glory days of Ray “Boom Boom” Mancini and Earnie Shavers. Both men are from Youngstown, Ohio, not far from the family farm where King grew up. He was bused to what he calls a rough middle school, where he resorted, unsuccessfully, to hiding his lunch money in his underwear. To defend himself, he learned to fight, and later was trained by a former Canadian boxing champion who delivered Budweiser to the motel, bar, and gas station on his family’s property. As a 126-pound lightweight, King became a Golden Gloves champion in boxing-crazy Youngstown. But fighting, even at a young age, took a toll on his spine and shoulder. After a bad fall, King could barely walk for weeks. Doctors didn’t provide much help. A chiropractor did. Once his spine and shoulder felt better, King became obsessed with alternative medicine and healthy eating. He converted his family’s farm to an organic operation. In 1975, he was accepted to both chiropractic and naturopathic schools at the same time that he was invited to the Olympic boxing tryouts. He chose education. He decided that he wanted to heal people, not hurt them. “The guy who won my class, his name was Sugar Ray Leonard,” King says. Boxing made him tenacious, King says, and gave him the confidence to do things that people said he couldn’t do. People questioned him when he started practicing natural medicine in the 1970s. They questioned the bison. And they questioned his earnest expectation for a life span at least 35 years longer than the average American. “Yeah, people think you’re crazy,” he says. It’s much easier to conform. 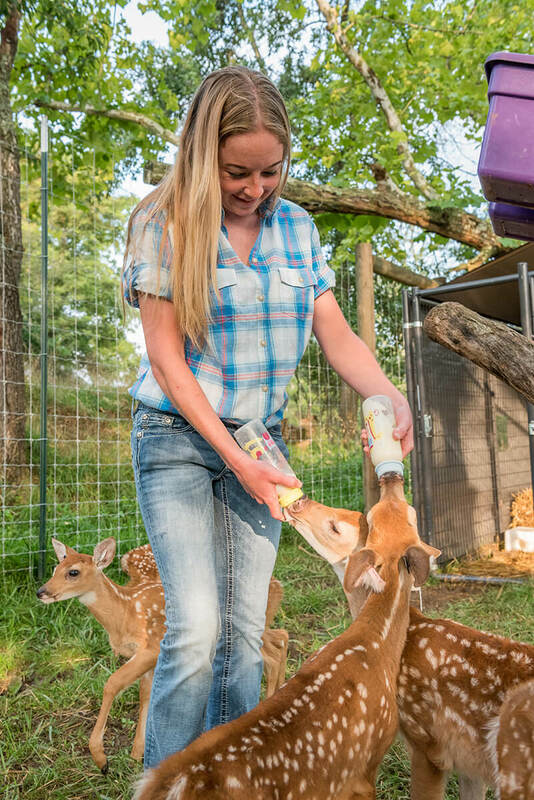 Rena Payne, one of the ranch’s newest farmhands, takes special care of the youngest deer. “You’ve grown to trust my crazy ideas over the years,” King says.